Lawn maintenance businesses are highly seasonal. Unless your business is based out of a state which is warm year round, you’ll have a busy season which is kicked off sometime before Memorial Day and ending sometime after Labor Day. In between the start and finish dates, you’re trying to cram as much work into those summer days as possible. What happens is that you work incredibly long hours, push your employees your summer feels like work has taken over. Your employees hit a point when they feel burnt out - you feel burnt out. There was an article written in Turf Magazine about a four day work week. The article pointed out a few key points that you should consider. While it looks great on paper, it might create some friction within your lawn maintenance business. If you can pull it off, it might mean a greater work/life balance. But here are a few things that you should consider before implementing the four-ten hour work days. Will your employees be alright with it? In the Turf Magazine article about this topic, the owner of the business they profiled implemented the four day work week of ten hour days. The owner said that his employees weren’t alright with the decision at first. They said that they wanted the extra hours and that the overtime was needed. At first, they weren’t a fan of being cut off from their overtime, but they started becoming more productive and their moods noticeably improved. 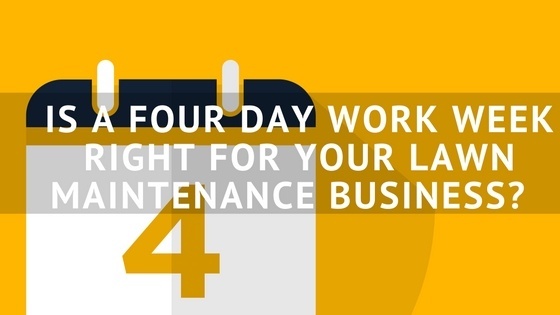 Implementing a four day work week for your lawn maintenance business requires you to take a step back from what you might be used to. The natural mindset for seasonal businesses is to jam as much work into a week as possible. Most lawn maintenance businesses will take at least a day off, but when there is work to be done, you might find yourself working on Sundays. So before you try out the four day week, are you going to be able to step back? Your lawn maintenance business might be able to get three days of work in during a week, but then your fourth day of planned work might be postponed by rain. Are you going to be able to trust that your employees can reschedule that fourth-ten hour day in order to finish up the work required? One of the concerns that the Turf Magazine article brought up was that the business’ employees needed to be flexible in order for the four day work week to work out. So your three day weekend might actually turn into a two and a half day weekend if needed, which might mean postponing a fishing trip you had planned. Do you have enough(efficient) crews to pull it off? The four day work week can only work if you have the lawn maintenance techs to pull it off. You need to be able to schedule and route your techs to jobs in the days that you are planning on working. It means that you need to schedule jobs more intentionally in order to have that coveted three day weekend.